"Osiander" redirects here. For Andreas' family, see Osiander family. Andreas Osiander (19 December 1498 – 17 October 1552) was a German Lutheran theologian. Born at Gunzenhausen, Ansbach, in the region of Franconia, Osiander studied at the University of Ingolstadt before being ordained as a priest in 1520 in Nuremberg. In the same year he began work at an Augustinian convent in Nuremberg as a Hebrew tutor. In 1522, he was appointed to the church of St. Lorenz in Nuremberg, and at the same time publicly declared himself to be a Lutheran. During the First Diet of Nuremberg (1522), he met Albert of Prussia, Grand Master of the Teutonic Knights, and played an important role in converting him to Lutheranism. He also played a prominent role in the debate which led to the city of Nuremberg's adoption of the Reformation in 1525, and in the same year Osiander married. Osiander attended the Marburg Colloquy (1529), the Diet of Augsburg (1530) and the signing of the Schmalkalden articles (1531). The Augsburg Interim of 1548 made it necessary for him to leave Nuremberg, settling first at Breslau (Wrocław), then, in 1549, at Königsberg (Kaliningrad) as professor of the newly founded Königsberg University, appointed by Albert of Prussia. Osiander lived and worked in Königsberg until his death in 1552. Osiander's son Lukas (1534–1604), and grandsons Andreas (1562–1617) and Lukas (1571–1638) also worked as theologians. His niece married the future Archbishop of Canterbury, Thomas Cranmer. Title Page of Brandenburg-Nuernbergishe Kirchenordnung, 1533. Title Page of an edition of the Vulgate from 1523. 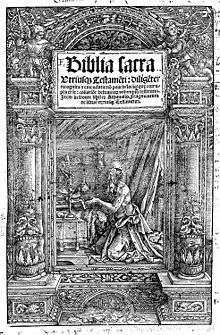 Osiander published a corrected edition of the Vulgate Bible, with notes, in 1522 and a Harmony of the Gospels in 1537. 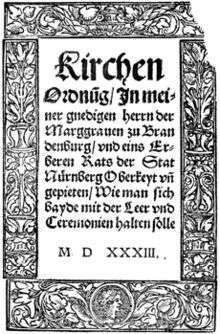 In 1533, Brandenburg-Nuernbergische Kirchenordnung vom Jahre 1533 was published, with Osiander assisting in both the source material the final editing. This combined order of worship and catechism was the first work to include the Keys section of Luther's Small Catechism, of which Osiander is a suspected author. In 1543, Osiander oversaw the publication of the book De revolutionibus orbium coelestium (On the revolution of the celestial spheres) by Copernicus. He added a preface suggesting that the model described in the book was not necessarily true, or even probable, but was useful for computational purposes. This was certainly not the opinion of Copernicus, who was probably unaware of the addition. As a result, many readers, unaware that Osiander was the author of the preface, believed that Copernicus himself had not believed that his hypothesis was actually true. Osiander also did not sign the preface added to Copernicus' book, therefore many readers at the time assumed that this is what Copernicus had actually thought himself. In 1550 Osiander published two controversial disputations, De Lege et Evangelio and De Justificatione. In these, he set out his view that justification by faith was instilled in (rather than ascribed to) humanity by Christ's divinity, a view contrary to those of Martin Luther and John Calvin  although he agreed with Lutheranism's fundamental opposition to Roman Catholicism and Calvinism. These beliefs were maintained after his death by Johann Funck (his son-in-law) but disappeared after 1566. Osiander's view has been described as similar to Eastern Orthodox teachings on theosis. Some historians, such as Tuomo Mannermaa, have argued that Luther's own views of justification, especially early in his life, were actually closer to the views of Osiander than to those of Flacius or what would later become confessional Lutheranism. Osiander was a Christian mystic and his theology incorporated the idea of mystical union with Christ and the Word of God. He believed that justification for a Christian believer resulted by Christ dwelling in a person. Contrary to Luther's belief that justification was imputed by God's grace, Osiander believed that the righteousness of a believer was accomplished by the indwelling of God; thus, God finds one righteous because Christ is in that person. Calvin rejected these views of Osiander, as did Melanchthon and Flacius. Flacius' opposing view was that God justifies us by Christ's work of obedience on the cross, not by his presence in us. ↑ Christian Classics Ethereal Library: Religious Encyclopedia, "Andreas Osiander"
1 2 "Union With Christ: The New Finnish Interpretation of Luther". ↑ "What Luther Didn't Mean". This article incorporates text from a publication now in the public domain: Chisholm, Hugh, ed. (1911). "Osiander, Andreas". Encyclopædia Britannica. 20 (11th ed.). Cambridge University Press. p. 350.
a According to the Formula of Concord articles identified (I–XII).